Jake Peterson's Blog » I Love My Job! Well the tittle pretty well sums it all up! Yesterday morning I was drinking my coffee working on the computer and I got a call from a pilot friend here in town and he asked if I wanted to come out and watch a F-86E Sabre do a test flight for the first time in 3.5yrs? I said heck yea! I knew about this particular plane already and I had fallen in love with it when I saw it parked in the hangar. With that stunning paint scheme who couldn’t fall in love with this Sabre. Well the morning flight had already happened but I went out for the afternoon flight which sadly got called off. It didn’t matter to me I was having fun just seeing this beauty parked outside. The best part was, I wasn’t the only one! Everyone on the tarmac came over including the folks over at the Jet center. It drew in all the crowds. I’m just learning about the history of the plane but as far as the paint scheme goes I know a little bit more about that. 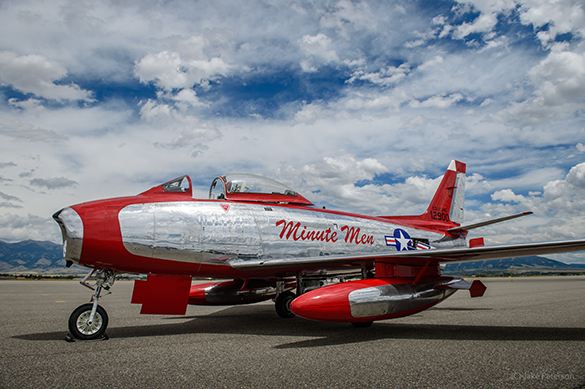 Instead of going with the more “traditional” look of how the Sabre would have flown in the Korean War, instead the owner decided to paint it in honor of the Colorado Air National Guard, Minute Men Flying Team. The team flew between 1953-1959 with 1953-56 being unofficial years. 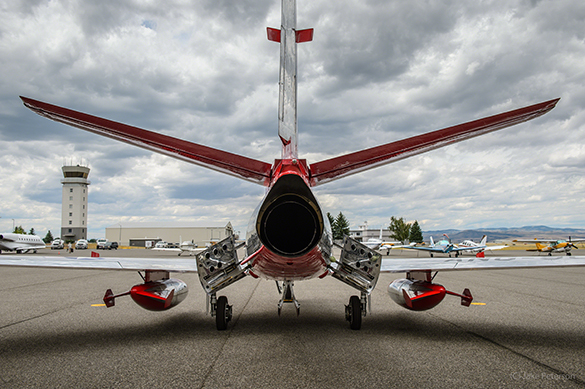 The team flew in 47 states in front of millions of people in over 100 airshows. The team even flew in five foreign countries in Central America. The Team was disbanded in 1959 after fiscal problems. The Minute Men Flying Team were pioneers for future flying groups and are said to be one of the greatest influences in Aviation for the State of Colorado. This particular F-86 is painted in honor of Capt. John T. Ferrier who sadly died due to mechanical issues with his plane and crashed outside of Dayton, Oh. No one else was hurt in the accident. His name and those of his fellow teammates are painted on the starboard side of the aircraft. Ferrier’s tail number is on the tail. 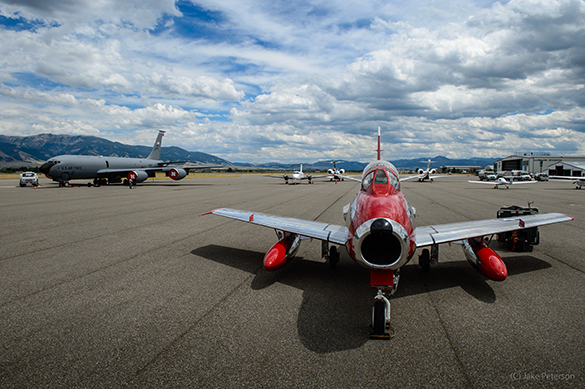 It is the only F-86 in the world painted in these colors. It always surprises how much is here in my neck of the woods and if a F-86E Sabre wasn’t enough for the afternoon this KC-150 that showed up made for a little more excitement on that ramp. The crew was coming down for fire bombing training but as soon as they saw the Sabre they immediately B lined to the plane. They later asked if they could do all of their training in the Sabre instead. The F-86 Sabre was very much a combination of technologies and ideas. When looking at the plane from the tail some of those charastistics pop out. The speed breaks for instance. The drop tanks with fins. The tail section narrows almost like the Me 262 did. Of course the massive bubble canopy and rather narrow body also are distinct. The center point of the wings are actually quite level with the tops and bottom sloping back and down. This plane was designed not only for performance at high altitude but as a fighter jet. In the Korean War it certainly did just that.